Thirteen national jurisdictions are covered in depth in this book. There are also general chapters on the global impact of merger legislation in the European Union and the United States, tax regimes, and private international law. The authors—each an expert in his or her own country’s insolvency law regime—provide precise information on the eligibility requirements, restrictions, and other provisions of the laws they discuss. They also analyze the important relevant cases in their jurisdictions. Jurisdictions covered: Argentina. Australia. Brazil. Canada. England and Wales. France. Hong Kong. India. Italy. Japan. Poland. Turkey. USA. Foreword. About the Authors. Preface. 1. Introduction: Formal Processes and Alternative Mechanisms of Reorganization in International Initiatives on Insolvency; A. Rouillon. 2. 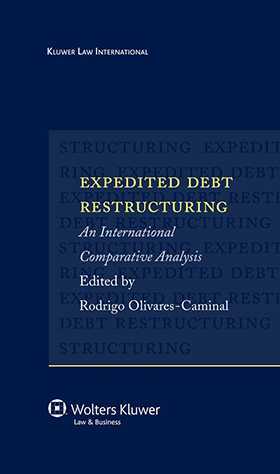 Argentina: Expedited Debt Restructuring under Argentine Law: Acuerdo Preventivo Extrajudicial (APE); R. Olivares-Caminal. 3. Australia: Voluntary Administration Leading to a Deed of Company Arrangement; I. Walker. 4. Brazil: Brazil’s Two New Mechanisms for Out-of-Court Reorganizations: ‘Homologation of Consensus’ and ‘Enforcement of Agreement’; L. F. Valente-de-Paiva. 5. Canada: Canada’s Expedited Debt Restructuring; K. P. McElcheran. 6. England & Wales: Schemes of Arrangement and Company Voluntary Arrangements; S. Bewick, M. Fennessy, D. Marks. 7. France: The Idiosyncracy of the French Judicial System and its Preventive Procedures for Expedited Debt Restructurings; I. Didier. 8. Hong Kong: Corporate Rescue in Hong Kong; C. D. Booth, S. Briscoe, P. Smart. 9. India: The Corporate Debt Restructuring Mechanisms in India; R. Luthra. 10. Italy: Article 182bis of Law 80/2005 and the Code of Conduct to Restructure Debt Issued by the Italian Bank Association; A. Auricchio. 11. Japan: Expedited Corporate Debt Restructuring in Japan; S. Takagi. 12. Poland: Out-of-Court Debt Restructuring in Poland; L. Giliciński. 13. Turkey: Pre-Packaged Corporate Restructuring Mechanism under the Turkish Execution and Bankruptcy Law; S. Simavi. 14A. USA: The United States Expedited Proceedings: ‘Pre-Packaged’ Chapter 11 Plans; L. P. Granfield, A. de la Cruz. 14B. USA: American Bankruptcy Reform and Creativity Prompt the In re Blue Bird Body Company One-Day Pre-Packaged Plan of Reorganization; J. M. Goffman, M. A. McDermott, K. Ramlo. 15. Private International Law Implications of Expedited Corporate Debt Restructurings; G. Arends. 16. The Tax Consequences of Corporate Debt Restructuring; D. Dürrschmidt. 17. Implications of Merger Legislation for Corporate Restructuring; I. Kokkoris.